Tangent launches PearlBox iPod/iPhone dock | What Hi-Fi? 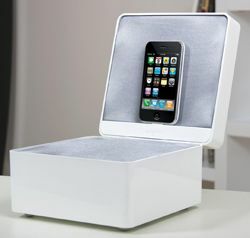 Tangent Audio has announced the PearlBox iPod/iPhone dock, yours for £120 and set to go on sale this September. Tangent has worked with designer Jean-Yves Le Porcher in an effort to deliver a dock that looks every bit as good – or "smooth", according to Tangent – as it sounds. Looking not unlike a jewellery box, the PearlBox has twin 1in dome tweeters in the lid and a single 3in midrange/subwoofer driver in the base section. Not a button in sight, control of the dock is via a remote control or your Apple device directly. The Tangent PearlBox will be available in high-gloss black with a red interior or a high-gloss white cabinet with a silver interior. Due out in September, the Tangent PearlBox is yours for £120.